A patient at a tuberculosis sanatorium north of Mae Sot swallows some of the 30 pills he takes every day while other patients wait for their medication. I visited a TB clinic north of Mae Sot. It's really more of an old fashioned sanatorium. On a hill within sight of the Burmese border but unlike most of the other clinics I've visited here, there's no village or anything nearby, just barren hillsides (this is the dry season, so everything is parched and desiccated). 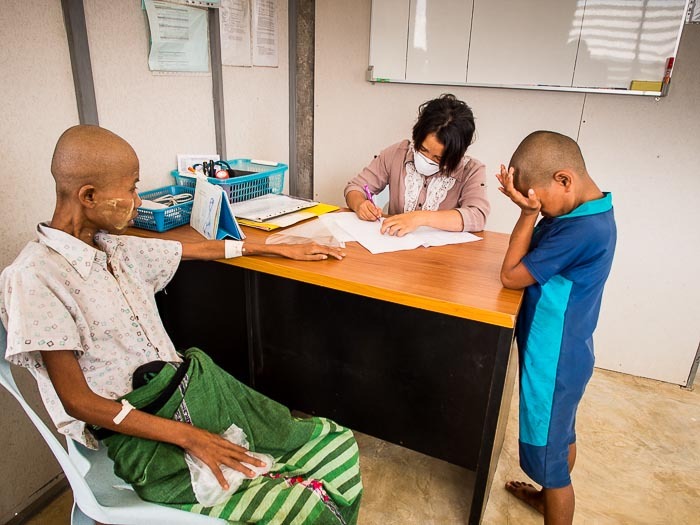 The sanatorium serves Burmese migrants in Thailand. The clinic's reputation has spread though and now people come from as far away as Yangon (about 30 hours by car or bus) for treatment of tuberculosis. TB is endemic in Myanmar. 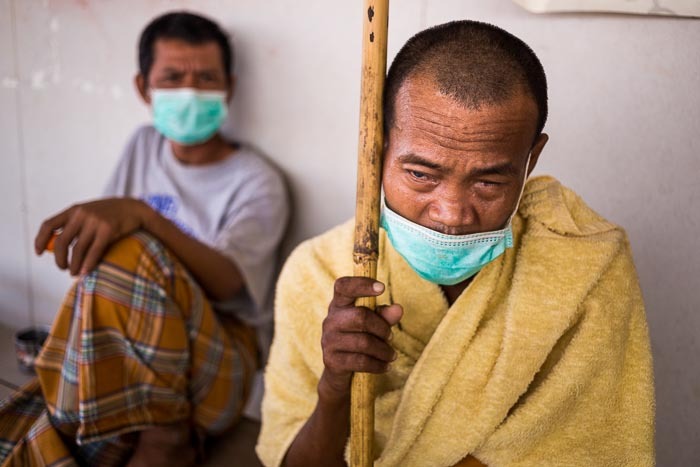 The infection rate is about 600 of every 100,000 giving Myanmar one of the highest TB infection rates in the world (Thailand is only about 120 of every 100,000 people). Because TB is contagious, patients are kept in relative isolation, which explains the Spartan setting for the center. A doctor (center) talks to a patient while the patient's daughter listens. The patient is 33 years old. Her daughter is 11 and is her mother's chief caregiver. Her father, the patient's husband, is a laborer who comes to the sanatorium when he can. TB used to be called "consumption" because the disease causes dramatic weight loss. I was struck by how emaciated the patients were. More than anything they looked like walking skeletons, aged well beyond their years. I thought the 33 year old woman was in her 50s. I thought the monk in the picture below (38 years old) was in his 60s. A monk waits for his medication. TB has a very high mortality rate. More than 50% of the people who contract the active disease die. Treatment is difficult and expensive. It costs more than $6400 (US) for a two year treatment regimen for a patient with drug resistant TB (a growing problem in Myanmar).